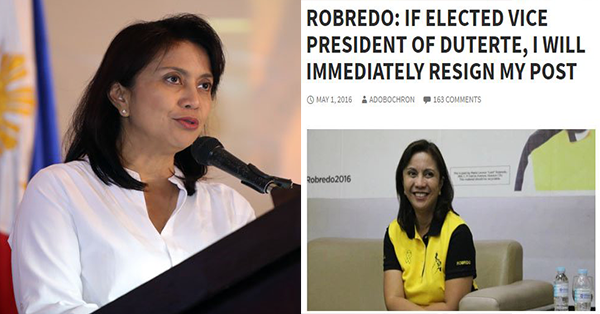 Leni Robredo Clarifies the Issue of Resignation if Ever She Wins as VP of Duterte! Vice presidential candidate Leni Robredo, who is now leading among other candidates, finally breaks the silence regarding the trending issue of her prompt resignation if ever she wins as VP of soon--to-be-president Rodrigo Duterte. This issue against her has spread very fast online. According to Robredo's press conference, she strongly denied those issues as she never said that ever, including the issue of planning an impeachment procedure against Duterte. She added that the said Facebook page showing post about her immediate resignation is not hers. Her team already reported the said account in order to remove and eventually stop making accusations against the aspiring candidate. It is normal to them having issues, especially for those who lead the race. But in knowing those issues throwing into them, let us do our part also. Be vigilant and wise to identify what is true or not because the truth should always prevail no matter what.